This is my June To Do List. Everyone is so busy these days. So busy, they can’t get anything done. People who brag about how busy they are have become some of my least favorite people (after conservative Supreme Court justices and the regime they enable, of course). Meanwhile, everyone is impressed by the fact that I do as much as I do. Sometimes, when I’m not lamenting my unproductive dawdling, I even impress myself. How does she do it? they whisper (in my Walter Mitty-esque fantasy). I’ve been thinking about how I do it today because I finished a few of my monthly goals early. It made me realize that I had made certain tasks out to be monstrous which were, in fact, manageable. For example, I needed to revise a novel this month, and I decided to cover 9 pages per day for 20 days (180 pages). Thirty days seemed like a slog; twenty days meant I could slip a few times and it would be fine. I did it in 10 days. I still need to enter my handwritten changes, but that’s much easier. As you can see from my To Do list above, I’ve reserved special check box for that. I also completed three case decisions this month, and blogged almost every day. I still have four days left to complete the other tasks, and I feel confident I will. You need to set a high level goal. I’ve got 4 up there, and that’s what I’m working on this year (at a minimum). The strategy for achieving those goals is to pick manageable tasks, broken down into smaller parts, and have a little reward system built in (making an X is very rewarding). 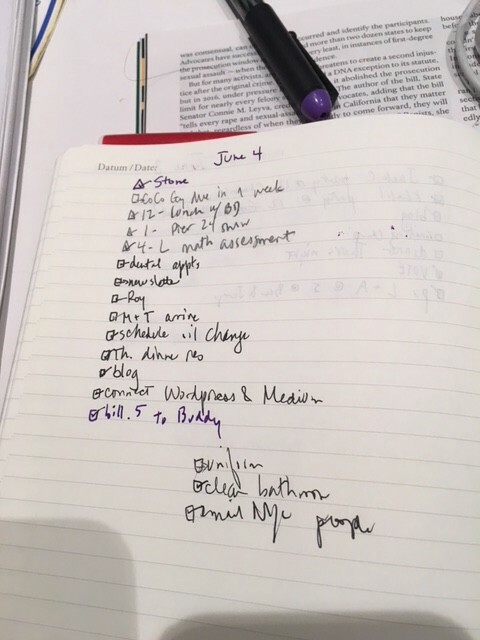 Another way I track my progress is in a journal. 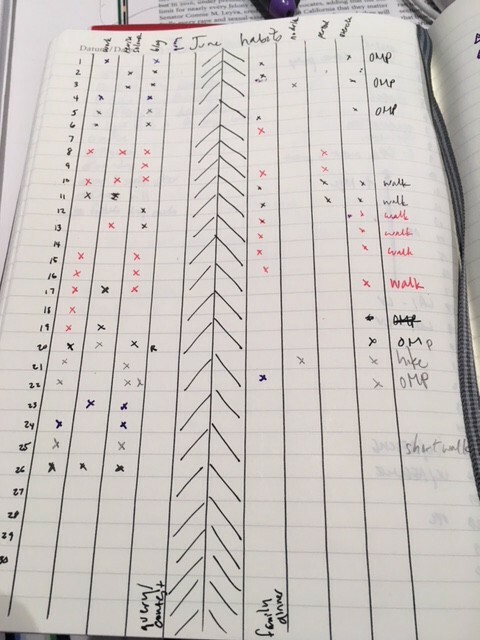 Here’s a monthly habit tracker that I create in my journal. 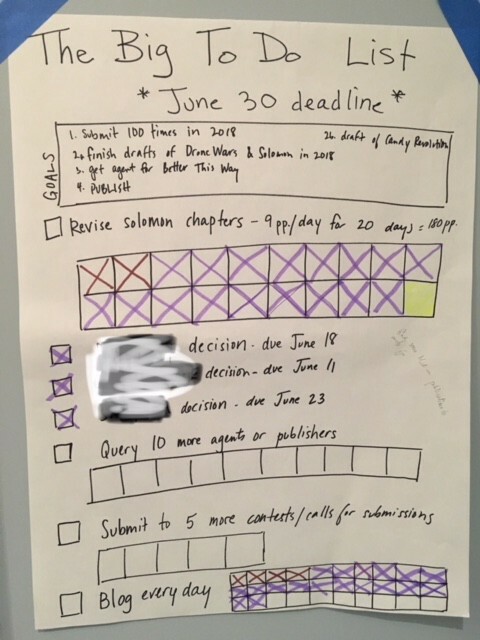 This month, I am tracking Work, Revise Solomon, Blog, Query, Family Dinner, No Drink, Periods, Exercise. Not drinking has taken a hit this month. Oops. I also track tasks, appointments and ideas all on one single page. This is basically sloppy bullet journaling. Putting a task on this list, and obsessively checking the list, really helps stuff happen. Again, it’s very rewarding to make that checkmark, and I never want to go to bed until I’ve checked them all. Any small goal will do. Ten minutes of mediation sounds impossible to me, but I bet I could do a minute a day. Five minutes of writing quickly becomes ten or twenty. What I realized from my revision project (and from trying to help my kids do their homework) is that people are terrible at estimating how long something takes. If you think it will take an hour, it will probably take twenty minutes. If you think it will take 15 minutes, it will probably take five. Set a timer for five minutes and see how much you get done. Then reward yourself with a check mark and try another five minutes. Write down how long it took in your journal. Some things take longer than you think, like your drive to work. Time it, and adjust your morning schedule accordingly. Pad the hell out of your schedule so that you can be early, finish quickly and stop feeling so rushed. Say NO to things. Don’t volunteer to get muffins for the teacher appreciation breakfast. Don’t accept any potluck invitations unless the first letter of your last name means you get to bring a bottle of wine someone left at your house. Don’t clean your house. No one else gets a YES until after you get a YES for your thing. If you don’t do it today, forgive yourself and keep going tomorrow. As you can see from my To Do List, I am behind on blogging, querying and submitting. Whatever, I’m celebrating the victories and planning the days ahead. I’m over here, not sweating it. (Check back in on Friday, I might be sweating it then).